When we were in the development phase of our Stone Cold Beads almost a year ago, we knew we on to something. The best part of creating a new product is testing it. 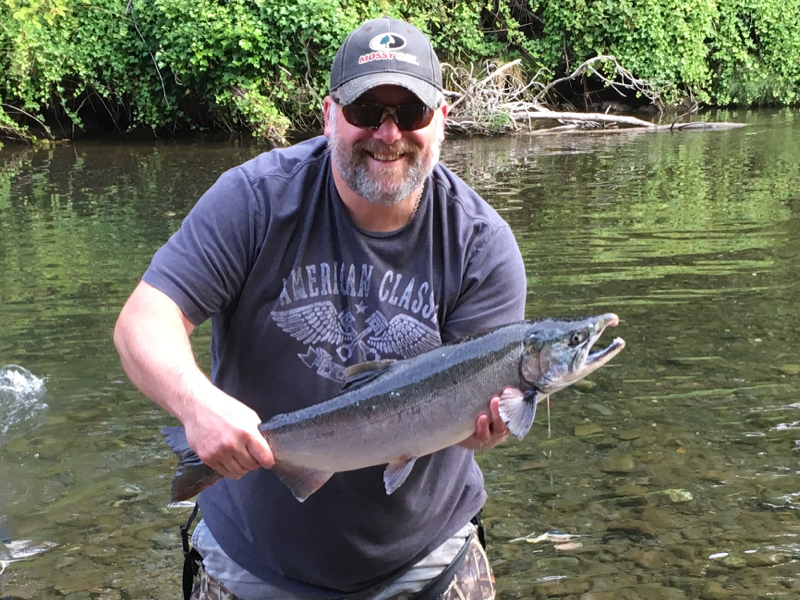 The goal was to see how well beads are performed when targeting Coho salmon on the Olympic Peninsula. In the past, we had some success fishing glass beads but we found that glass beads tend to break when drifting off the bottom. However when rigged up right we were able to get some fish to bite with a couple of tricks we had up our sleeves. This gave us some background for our new Stone Cold Beads only this time our beads were made of natural stone and since they are denser than glass beads they provided additional weight thus were perfect for fishing in faster current situations. Initially, we ran just a single bead. The trip to drifting beads is to cast up the river at least 10 ft. in front of the hole where the fish were stacking up. Once the fishing bead setup sank down the bottom it was just a matter of reeling in the slack and occasionally giving the tip of the pole a little pop to keep the setup from getting stuck on the bottom. It took a while but after a couple hours working the holes we were able to hook up with a pretty nice Coho on our 10mm Orange Crusher bead. Next, we decided to change it up and go with a double bead set up. After another 10 – 15 cast we had our next fish on running one 10mm and one 8mm bead together. After that, it was time to go old school and incorporate a little yarn. I personally believe that less is better when it comes to yearn. An old guide friend of mine once told me never to left the yarn hang below the hook because salmon and steelhead can feel when they go to take your bait and that they don’t like it. I don’t really know much truth there was in what he told me but now I try not to let the yarn hang down any farther than the middle of the shank of the hook. Even better my yarn lasts longer now too. Now some folks see yarn as an attractant, I personally use it to hold scent. Every professional angler knows that scent can be the differences between having a fish follow your lure and turn or chase it down and striking. Over the years my personal experience has been that using a scent that most closely matches the natural food source of the species you are targeting will produce the best results. In regards to bead fishing for Coho, I generally use salmon egg scent. I like to soak my yarn a couple days before a fishing trip. The key is to let the scent actually dry and then re-apply and allow to dry again. This ensures that the scent will hold on the yarn longer, when on the water. I also continue to add scent to my setup when in the field. My point is that scent is extremely important and I use as a result I use a lot of it. With that in mind, once we started drifting beads with some stink on it, things got interesting very fast. Now when drifted our bead set up into the school our hook up ratio literally doubled. It was at this point when we started limiting out too fast had to release a few so we could keep fishing. We ran several color combos. Fire engine, Mottled orange, Orange Crusher, Green grape and more. All produced good results. By the end of the day, we had caught and released a ton of Coho and finally limited out and went home. The beauty of it all was that we confirmed what we already know. Fishing Stone Cold Beads is one of the most effective methods available for catching Coho.